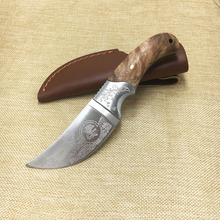 Very sharp handmade Damascus hunting knife. Damascus steel blades are characterized by distinctive patterns of banding and mottling reminiscent of flowing water. Such blades are reputed to be tough, resistant to shattering, and capable of being honed to a sharp, resilient edge. Perfect gift for a hunter!